BEIJING - The landmark Beijing-Shanghai high-speed rail line will open in June, months ahead of schedule, the Minister of Railways Liu Zhijun said on Tuesday. Addressing a conference in Beijing, Liu also announced a major expansion of the high-speed rail network, which will be extended by nearly 5,000 km this year, taking it past 13,000 km by the end of 2011. At the end of 2010, the network stretched to 8,358 km, the world's longest. Some 5,149 km of high-speed track were put into service last year. The network now accounts for one third of the world's total, almost 25,000 km in 17 countries and regions, including Japan, France, Germany and Italy, according to the Ministry of Railways. 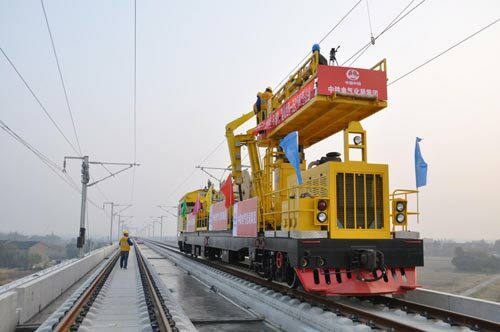 There are plans to invest 700 billion yuan ($106 billion) in railway construction this year, Liu said, a figure that almost reflects last year's 709 billion yuan investment. As a result, the national rail network has expanded from 86,000 km in 2009 to 91,000 km in 2010. This year's investment is expected to expand the network by 7,901 km to some 99,000 km in total, and the high-speed rail network will be extended by 4,715 km to just over 13,000 km, according to the ministry. 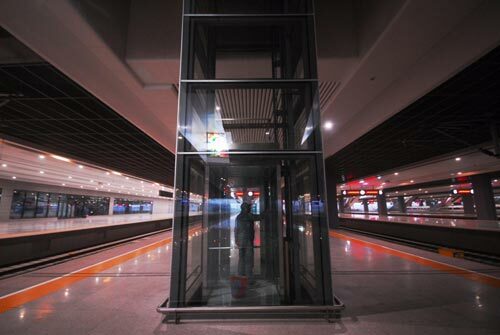 The opening date of the eagerly anticipated Beijing-Shanghai line has been rescheduled twice - the initial schedule was for 2012, but earlier last year officials suggested it would be operational at the end of 2011, according to previous reports. But rapid progress in the construction of the 1,318-km railway track, which started in April 2008 and ended in November 2010, has seen the completion date moved up to mid-June. Workers are now installing the railway's power supply and communication systems. Once in service, trains with a top speed of 380 km/h will slash the travel time between the two cities to only four hours, down from the current 10 hours. Liu also stressed that ensuring "absolute safety" of operations is the priority for all railway departments. "There will be zero tolerance for errors or defects," he said, as a perfect operation record will be crucial for the construction of high-speed networks as well as China's reputation and railway technology exports. The ministry now aims to export its technical knowledge of high-speed railways to other countries hoping to build or expand their own networks. "Given the scale of China's high-speed rail network, it is possible for China to take a lead in establishing the technical standards for high-speed railways of around 350 km/h," Yang Hao, professor at Beijing Jiaotong University, said. Liu urged that potential overseas high-speed rail markets be explored, including in the United Arab Emirates, Brazil, the United States and Russia. He also said preparation work for cooperative railway projects in Laos, Myanmar and Turkey should speed up this year, so that "these railway projects can start construction as soon as possible". According to earlier media reports, China will help build a railway linking Laos and China as early as 2012 as well as a 1,920-km railway from Kunming, capital of Yunnan province, to Yangon, Myanmar's largest city.